I got my start in distance riding from my good friend Glee Bohanon who mentored me in 1983. I came from the show world, but never really loved showing, distance riding sounded like fun, and once I did my first ride, I felt like I finally fit in. Back then the sport was still evolving and much less sophisticated than it is now. (We simply know so much more now.) 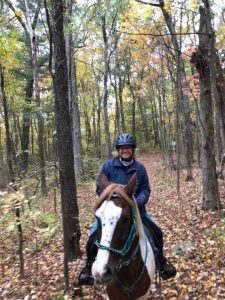 There were only Competitive trail rides (mostly 25 miles) and 50-mile (or more) endurance rides. Most everyone was competing in the Competitive. So that’s where I started myself. 36 years later, and I’m still heavily involved in the sport and it has become a big part of my life. This is sport of longevity for both the riders and the horses, which is one of the things that I love about it. I still ride both Competitive Trail and Endurance and have ridden one day distances from 15 miles all the way up to 100 miles. 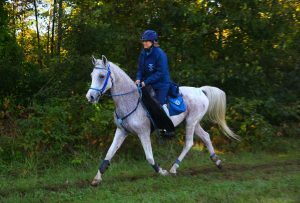 I like both types of distance riding and go back and forth between them depending on the horse I’m riding and my goals. I have managed the Brighton Spring CTR ride for the past 19 years. And have always offered 15-mile novice rides to get folks started in the sport. About 10 years ago I came up with the concept of the “Tutored Ride” to offer new riders someone to help them through their first ride. (the Tutor was usually myself) Starting this sport, when you don’t know the rules or anyone to ride with can be daunting. This is a way to relieve some of the stress. Usually once a rider has done one ride, they realize it’s not scary at all and that the other riders are all welcoming. Mentoring is also another good way to get started. I have mentored many riders through my Tutored Rides and through the mentor program and take great pride in seeing them succeeding and enjoying the sport that I love. Sharing the knowledge, I have learned is very important to me and I do it with joy. So, don’t hesitate to reach out, it is my pleasure to assist you if distance riding is something you wish to pursue.